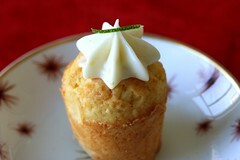 The texture of this cupcake is interesting, not quite a cupcake or a muffin... almost like a fruit cake, but nicer. The cake is moist, chunky, and fruity. After having tasted it, I felt that vanilla pastry cream would have been a nice compliment. 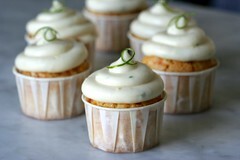 Unfortunately, with limited time to shop for more eggs, I stuck with the plan of ginger-lime cream cheese frosting. The end product is still delicious and I will happy to bring them to the party. On a side note, yesterday was the official one year anniversary of the blog. This will be the 30th cupcake recipe that I have posted and to celebrate, oh how exciting, I will be posting the 31st tomorrow. 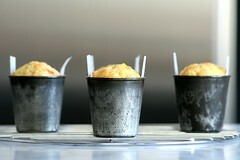 And lastly, for those of you in the bay area, I am told there may be an article about cupcakes in this Wednesday's San Francisco Chronicle, in the food & wine section. Check it out if you get a chance. Ooooh, pretty. Can't wait to check out Wednesday's Chronicle. Thanks for the tip! Question for you... 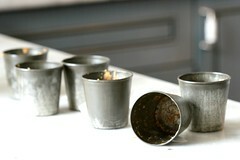 I really like the little molds you used for these cupcakes... they look like vintage tin? Wondering where you found them? I like the individual tins! Chockylit, you mentioned that a filling of vanilla pastry cream would be a nice compliment to this recipe....is there a particular recipe you'd recommend? I'd love to try it. ...although I live in Minneapolis, I was able to check out the story in the San Francisco Chronicle today...congratulations! What a great article! Thank you for sharing your ideas and inspiration. Can't wait to try some of these recipes! I'm so glad I found this blog! Everything looks delicious! This recipe says "1/4 coconut milk": Do you mean 1/4 can? 1/4 of the milk from a coconut that one cuts open oneself? I'd love to make this recipe this week! Getting back to sawsee. I don't have a recipe off hand. I usually go to one of my cookbooks for a basic recipe. MarthaStewart.com is a reliable resource for this kind of thing as well. Just wanted to say, I did get around to making these on Wednesday, and we all loved them. The Consort & I loved them because they aren't at all like kid cupcakes, they've got heft, texture, and great "grown-up" flavor. On the other hand, the girls really liked the cupcakes too, so maybe it isn't "grown-up" as much as "universal". Btw would you have receipes for Basic Vanilla cupcakes? Something thats fluffy and nice. I have been looking around the internet and haven't found much. Chockylit, those photos are beautiful...you must be blessed with naturally good lighting! I think its a good idea to use the frosting as a filling. In part, because you are talking about a summer wedding and this frosting wouldn't hold up well in a hot environment. Thanks so much for the advice...I can't wait to make these! These took me about four hours to make, but it was really fun and the results are yummy. I've gotten a lot of compliments. The presentation tip was especially useful, although I substitued apricots for papaya and that worked well. Thanks so much! 3) For the frosting, I tasted it and wanted it more "lime-y" so I added about 1/2 t lime zest and I thought it made it a bit more tangy and tropical. Tasty. While I was baking, Serious DJs (my boyfriend + our good friend) were working on a mix for their website - seriousdjs.net. They enjoyed the snacks so much, they named the mix after them. A strange tribute to your recipie, but I thought I would let you know.